Welcome to DJ Debriefing, a new series of LWE features where we ask DJs about the music they’re actually playing, both old and new. DVS1 is up first in the hot seat. This Minneapolis-based DJ/producer, born Zak Khutoretsky, has been wrecking the decks since the 90s but has only in recent years come into international prominence. This is partially attributable to his productions, which have been released by techno institutions including Transmat and Klockworks. But it’s his excellent, genre-busting DJ sets (regularly appearing at Berghain, for example) which have him in high demand at venues around the world. In advance of back to back gigs at Output NYC this weekend, LWE got in touch with Zak to have a peek in his record bag and thumb drives. What would be one of your favorite opening tracks, something to get your set started no matter when you’re playing? Zak Khutoretsky: For me, it’s always kind of back in the 90s vibe of how people created something interesting to open their sets with. You know, they really destroyed the mood or stopped the mood of the previous DJ and kind of restarted it. And sometimes I notice that people will just kind of start out with a drum track right away or something else. I have a folder that I’ll travel around with, with either rips of vinyl that I’ve pulled out from my studio, or I’ll carry a couple records with me that have some type of an intro, whether it be some ambience, whether it be — you know, just some weird vocal, speaking sample. Just some kind of mood to just kind of cleanse everyone and restart the vibe based on wherever I want to take it at that moment. So I don’t know if there’s ever one particular thing that I always start with, but I always just kind of try to start over and press “reset” every time I go on. Can you think of a track that you like to use for getting yourself out of a jam with a crowd? I would always say my default is always to pull a Jeff Mills track. If all else fails, Mills has got a vibe for everything. He’s got everything from the Purpose Maker series that’s more funky to the old Axis stuff that’s a little bit harder and grittier. So depending on where I am and if all else fails and I just need something that’s a surefire kind of — it works, I always kind of resort back to a Mills-era track or a Rob Hood track. They’ll always kind of pull me back out and get the momentum going again for me. Tell me about a track that you never expected to work when you heard it, but then you actually played it and it works really well. Alright, you’re putting me on the spot here. Trying to keep it interesting. Yeah, yeah. Definitely, definitely. I’m so used to the normal questions; I’m unprepared for real questions. This is going to be an odd one, but I’ll lead into it and I’ll explain it. The one thing that I was always known for is playing things out of context. I like to play house tracks a little bit faster and I like to play old techno a little bit slower. I try to pull things kind of that maybe weren’t meant for where they are supposed to be, but they work in that context. That’s excellent. Kind of on a similar vibe: what are one or two of your favorite go-to tool tracks? I’ve got to remember which track it is. But there’s an old User record that’s just, like, a proper tool. Really interesting percussion, really steady throughout the whole thing. It’s a good 10-minute, just steady tool. It’s sinister, but it’s got that funk to it, and I don’t think that’s left my record bag since it came out 15 years ago. It’s a layer that I always add in; in every set, sooner or later it’ll pop in. It’s got this momentum and this vibe that just makes things kind of serious. I don’t even know how to put it. It changes it up, and it just kind of adds this texture to everything. All I can remember — it’s a black User record with white writing on it. And like I said, it’s just been in my bag forever. That’s actually a great segue into the next question, which is what would you say the oldest record is that’s still in your bag? Here’s the interesting thing about my traveling: now that I’ve started traveling, the one thing that’s changed in my DJing style where — before I was on the road a lot, I strictly played only vinyl. So new, old — really didn’t matter. But the more I’m traveling I’m realizing that things have changed, and I’m probably playing 50 percent off USB sticks and 50 percent off vinyl. So what I’m reserving the room for in my bag is mostly older vibe of techno, and I’m leaving the USB sticks for new stuff. OK, so of Technics 1200s, there’s the 1200 MK5G, which is a turntable that goes plus-minus 16. It’s the only Technics model that has the extra button to increase the pitch by an extra plus eight. I always request those, but I only get them about 50 percent of the time. I use those to play, like I was saying, old house records sped up or old techno slowed down. And I started realizing that I wasn’t going to get those everywhere, so I started ripping some of those records in my studio so I could play them out of context on the spot. Whether it be on CD or vinyl, didn’t matter where I would go, I would have the opportunity to play them. But my bag is mostly reserved for that 90s vibe of techno that I come from, that I really appreciate. And sort of the opposite of that: what would you say is probably the newest thing that you just added to, I don’t know, you’re digital file collection, if that’s where most of that stuff is being stored? The one secret weapon that I’ve been pulling everywhere — and it’s actually multiple secret weapons by the same person — is Eduardo de la Calle. When he first came out with the whole Analog Solutions label, I was a really big fan of it. He skillfully did the whole edits project, and obviously he took a lot of old edits from old Carl Craig tracks, old Plastikman tracks, and some people got mad at him, but I think he did it really, really well. And at the beginning he wasn’t even putting his name on it. They were called DISCO 001, DISCO 002, DISCO 003, and they were just edit records that were coming out. I kind of disagree with the fact that he put his name on it now because I feel like everyone already knew it was him, but there are so many amazing edits that he’s done, and he keeps making more. And the first handful of Analog Solutions records, the quality of them was actually really poor, like the mixdowns and the mastering were really terrible so they kind of didn’t hold their weight against a record standalone. But as a layer in a mix they worked really well. But some of the most recent stuff that he’s done, the quality has come up tenfold, and the edits are just really amazing, and he’s just capturing this really great mood and really great vibe. And I’ve been playing those everywhere. What would you say is this year’s summer jam in your crate? Or maybe the anti-summer jam. Let me think, let me think. Can it be a track that hasn’t even come out yet? This is going to sound like I’m self-promoing something, but I’m starting a second label called Mistress, and it’s basically a label for kind of secret weapons and tracks that I’ve been playing from artists who have been sending me things from the last year or two. I’m going to be releasing a track, and it’s called “Mercy.” And it’s by an artist named Marquis Hawkes; it’s an alias for somebody who’s been around for a long time. Every time I’ve played it — I got it about four months ago, so I guess I’ve been playing it over the summer — and it’s been the destroyer of every one of my sets. It’s the track that people write me after my sets with little video clips or audio clips and they’re like, “Please tell me what this is. Please tell me!” And it’s always been that track. And I’m probably going to put it out in the next six months or so on this new label. So will that be the first record? No, the first record is actually — there’s a young German artist named Borrowed Identity. He’s going to be the first artist on the label. Before he had a couple releases out he sent me some things that I just locked into right away, and he was kind of one of the main ideas for me to start this second label. He’s a kid who is mostly known for his house stuff, but he can make techno, he can make disco, he can make anything. And even though people know me as a techno guy, I come from an era of proper house and proper techno, so I’ve played house sets, I play all kinds of stuff, and his music just fits really well. So him and I have really been working closely. He’s going to be one of the main artists on the new Mistress label. So he’s doing the first release, and it’s actually more of a house-based released, whereas the second one’s going to be a little bit more gritty, the third one is going to have a various artists release where it’s going to have some really fast, old, like, 90s-style, 137-BPM techno on one side, and it’s going to have some housier cuts on the other side. So this Mistress label is basically anything I want it to be. Where Hush is my first love — it’s techno, it’s mine, there’s no remixes, there’s no outside artists — Mistress is a platform for all the things I love on the side. Sounds like you have big plans for it already. Yeah, the first release is actually at the pressing plant right now. So kind of going along with that, do you ever play your own tracks? You know, I try not to, but it’s not even that I don’t enjoy playing my own tracks, for some reason I steer away from playing my tracks just because I feel like everyone’s heard them before. But I try to remind myself to play some of my own because I remember what it was like being on the dance floor and hearing somebody play the track you know them for. It’s kind of a special thing to hear that artist play their track, especially when it’s not an over-hyped or over-played track. So I try to remind myself to squeeze a couple of my tracks into all my sets. Usually I try to take the ones that aren’t really the most obvious ones. Yeah, I was actually going to ask if there was one that you like for that reason. Recently I re-pulled back out — because I heard somebody else play it, and I was on the dance floor and it just sounded really good. I re-pull out a remix a did for Lucy on Curle Records Prologue. It’s called “Kalachakra.” I did two mixes — “Eyes Open” and “Eyes Closed Mix,” and I’ve been playing the “Eyes Open Mix.” I’ve been playing that in every set, and it’s actually a really fun track to play. When it came out, I only played it a few times and kind of overlooked it. I realize now, even looking back, a lot of my earlier productions I’m so much more happier with than some new stuff that I’ve been making. Just because there was almost a naïveté to what I was doing then. I was just doing what I felt without overthinking it, and that track is a perfect example of that vibe. To that end, I’m just idly going on Discogs and just looked up your profile, and from the looks of it, you haven’t put out a new solo record since 2011. Is there going to be something new coming from you in the near future? Yeah, you know, it’s been really difficult. As you know, I live in Minneapolis, and I live on the road, and only until about five, six months ago did I finally start to make a balance between being in Berlin and being in Minneapolis. I acquired a studio to work out of there, and I got a proper living situation when I go there about a year and a half ago. So it’s taken me the last three and a half years of traveling and only about six, seven, eight months ago, to find myself in a position where, when I get off the plane, I can settle into my own place and then go to the studio once my jetlag kicks off. Because before I was really kind of stuck with every time I came back to Minneapolis, I might have a week or two weeks at home, and you never know the vibe you’re in, you don’t know where your head’s at. So all I did was just maybe five or six remixes over the last year and a half. I mean my own label Hush only had one release out. But in the last six to eight months, I’ve finally knocked out and finished about 10 new tracks. I’m going to start releasing them on Hush right after I introduce the new label. So the short answer is yes. I’m finally, in the next six months, going to start pushing out some more original stuff, and I’ve actually really adamantly said no to most remix projects. I think the last one I just did was the Nina Kraviz one that just came out for REKIDS. And that was kind of the last obligation I had, and there’s a few more on the horizon that I might take, but I really want to focus on original stuff again. And then one last question with regards to sort of favorites: I was hoping you could tell me what kind of needles you use, what kind of headphones you use, and what’s your favorite record bag? OK, so the Sennheiser HD 25-2s, for headphones. Needles, it’s either going to be the Ortofons — but I actually like to mount the Ortofons on a regular Technics headshell. They have a little bit better weight that way. Otherwise, the Shure M44-7s are really good. So I’d say between the Ortofons mounted on the Technics and the Shure M44-7s. And record bag, you know those Airbag Craftwork bags that a lot of these guys are using? They split in half. Have you ever seen those? I wish UDG would make a mix between that and UDG on wheels because the problem with those Airbag Craftwork ones is there are no wheels, but they split in half and give you two boxes to hold your records. But the UDG little trolley is just kind of the easiest go-to. I go through, like, one a year, but those bags are just kind of the trusty record bag. Yeah, it seems like that’s the hardest thing for traveling DJs to decide right now is, how do I get my records from point A to point B safely and without breaking my back. Well, I don’t know if you’ve seen it, and I’m waiting for somebody to re-kick this, but I want to say Kompakt had bought the rights to and made about 600 of these Rimowa record boxes, like the big square ones. And they were a custom record box that Kompakt got the designs for, and they did it with Rimowa, and I missed it by a month when I first discovered them and they had already sold out. And for a while, either Hard Wax or Ostgut [Ton] was trying to take over the patent and make those boxes again because everyone loved them. But nobody’s done it yet. But if that box comes back out, that’ll be the box I go buy. Anything else you want to tell us about what your plans are for the next 12 months? You kind of covered a fair amount of ground earlier. I mean definitely the labels; you’ve already got that. So Mistress, the Hush stuff, new Hush stuff coming. Everything we do as producers kind of has a six-month life in the sense of whatever things we put out now, whatever decisions we make now, we don’t really feel the effects for about six months. For the last year is I’ve had a lot of gigs, and I’ve toured a lot, and part of that was just to get my name out there and to establish what I do. For next year I really kind of want to pull that back a little bit. And I want to be a little more selective and a little more fine-tuned about how many gigs I play, how much I’m touring. Because I want to find more time to write music. You know, I’m finally finding the pleasure in writing music, so I want to find more time for it. Really, this is the type of stuff that is interesting for artists to talk about and fans to read. Thanks LWE. I’m sure Zak was relieved to get some new questions, too! See ya in Atlanta on the 31st! I totally agree with Propertrax. 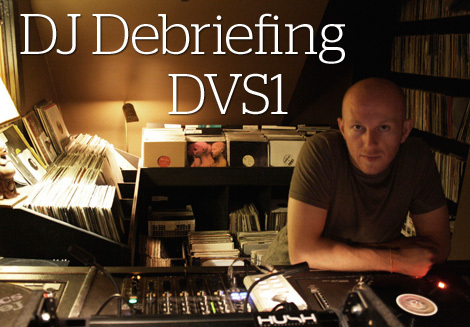 This has got to be one of the best dvs1 interviews ever. Great interview. Excellent questions. Sounds like it was written/conducted by another DJ, and not someone that has no clue what it means to mix two records together. Definitely looking forward to hearing more Hush releases and releases on this new label, Mistress. I think I have that same user record too! Still wondering when a DVS1 2×12/LP will drop… Major Props! Nerdy correction: the remixes Zak mentions for Lucy, Kalachakra “Eyes Open” and “Eyes Closed Mix”, were on Prologue not Curle. Thanks for sharing Analog Solutions & Airbag Craftwork.